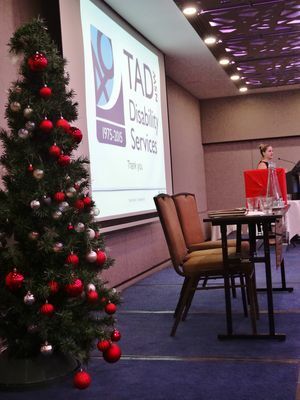 TAD volunteers shared information and ideas with thanks to Parramatta City Council at the 2015 Volunteer Conference. From guest speakers to problem work-shopping, the Volunteer Conference was a great day of information sharing, networking and celebration. Being in our 40th year, TAD, with support from the Parramatta City Council, thanked the wonderful volunteers who selflessly give their time and expertise to help change the lives of people living with a disability. 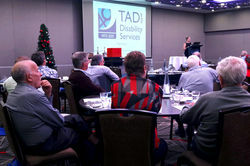 CEO Danny Kapustin opened the conference with a presentation about TAD’s future and strategic plan and we were fortunate to have Sarah Morgan from the National Disability Service (NDS) speak to volunteers about the National Disability Insurance Scheme (NDIS) and future roll out. After a Christmas lunch TAD Volunteer Neale Taylor put a 3D printer into action setting up and printing a new project for everyone to see. The next speakers, TAD Volunteer Paul Taylor and Operations Manager Brendan Worne, provided valuable information about Mandatory Reporting and Safe Home Visiting. We were also fortunate enough to have TAD Volunteer Jim Barrett show a fascinating common interest video about the installation of the Man Roland Newsman 40 web offset presses, at the News Limited printing plant in Melbourne, which is still in use today. A highlight of the conference was hearing from Karen Keith, mother of TAD Client Arran, who gave an emotional insight into how the magnificent work by TAD volunteers have helped her son Arran hit milestones that we all take for granted. Development Manager, Alison Bray then spoke about the 2016 Marketing Plan and led attendees through a group exercise where everyone was able to share their favourite projects. Attendees voted on the design of new Volunteer shirts (thanks to some skilled models), some won Bunnings vouchers and Keith McKay from the Illawarra Group won a lovely Christmas hamper filled with goodies. Thank you to all our speakers and everyone that attended the event. Congratulations to the following volunteers who received awards for their years of service at TAD.